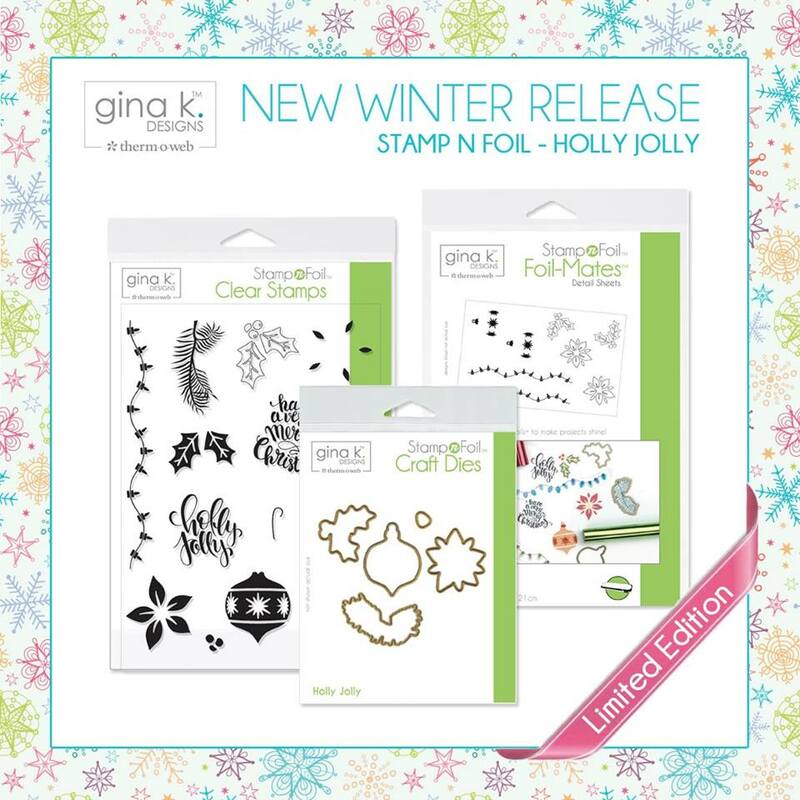 I am here with Gina K. Designs showcasing the newly released ThermOWeb Stamp-n- Foil™ Holiday release. This release is a "Limited Edition", so get it while they are still in stock. The design team has created some amazing samples that will surly give you some inspiration to start your holiday projects. Come hop along with us and comment on each blog post, one lucky winner will win a $50 gift card to the Gina K. store! Here is a look at the whole release! 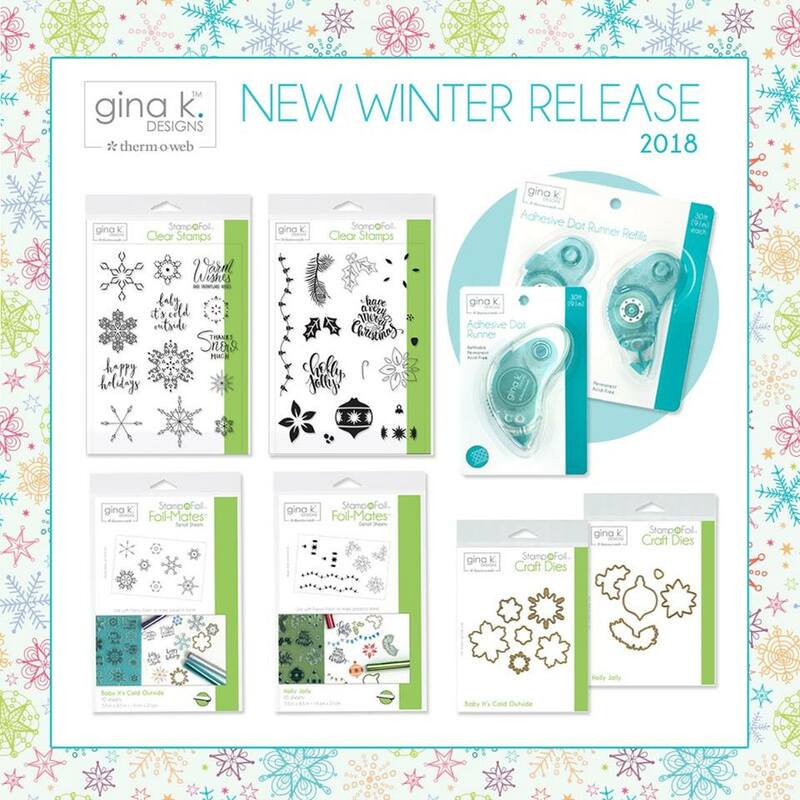 Gina K. has come out with her very own Adhesive and I love it! You can find all these products in the Gina K. Designs and the list of products are at the end of this post. 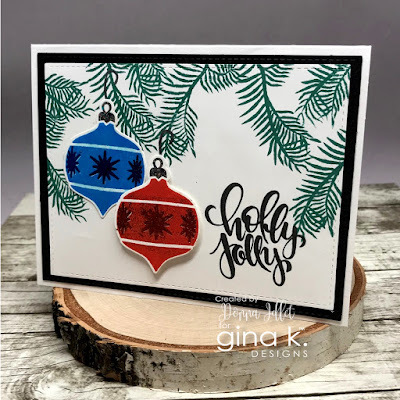 My first two cards are from the Gina K. Designs Holly Jolly set. All the supplies are used are listed at the end of these two cards. 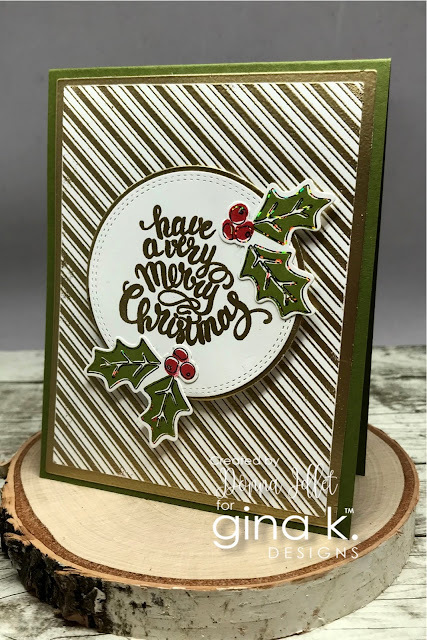 I heat embossed the background with Gina K.'s fine gold embossing powder, I also used it on the edges so the gold would match. I also heat embossed the sentiment. I love how the foil shines in these ornaments and I love the script on this sentiment. My last two cards are from the Baby It's Cold Outside. All the supplies are at the end of these two cards. My first card is clean and simple. 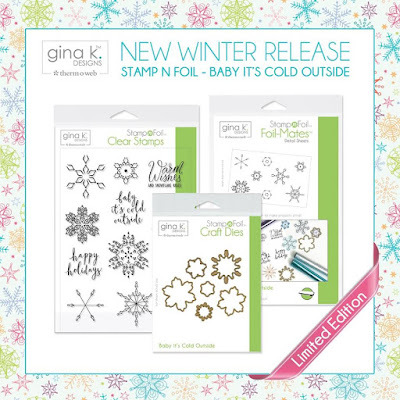 Don't you love these snowflakes, there are so many to choose from in this stamp and foil set. Another beautiful snowflake from the Baby its Cold Outside set. Thank you so much for stopping by! Are you ready for more awesome creations and inspiration? Just click on the links below. Don't forget there is a $50 gift card to the Gina K. store for one lucky winner! Awesome sauce Donna!! I totally loving the pink one, love using those nontraditional colors for Christmas! Beautiful. The pink card is stunning. I also am impressed by the non traditional colors. Pretty cards! Gorgeous cards and ideas! Love every one! I especially love the non traditional colored pink winter wishes card! Great cards - especially the pink snowflakes! Thanks for your ideas! Love the pine branches and shiny ornaments! Adorable cards! Love the pink snowflake card. Such beautiful cards. Really love the one with the ornaments! Super cards. I love the pink and black snowflake. And the tree branches with the ornaments - WOW! I would not of thought pink for snowflakes but boy that is my favorite card. Love it. Beautiful cards, Donna! Love all the sparkle! I really like the gold card. I love the Holly Jolly card! Although all are beautiful! All beautiful cards! Makes me think about trying foiling again. I am realizing how much I like stripes!!!! Wow! The cards are beautiful. The products look wonderful. Will need to get some for my collection. Thank you for this opportunity. All are the beauties for the upcoming Christmas holiday. I am new this foiling, so thanks for showing me how you've used it. Awesome cards! I love the pink snowflake card. these are beautiful! I love the ornaments hanging from the tree and pink snowflakes! totally awesome idea! Love your use of non-traditional colors on your snowflake cards! Thanks for the inspiration! Love your color combos...so gorgeous! I love the green themed card. I may scraplift this design. Wow! Love them all! Thanks for sharing! Beautiful cards! 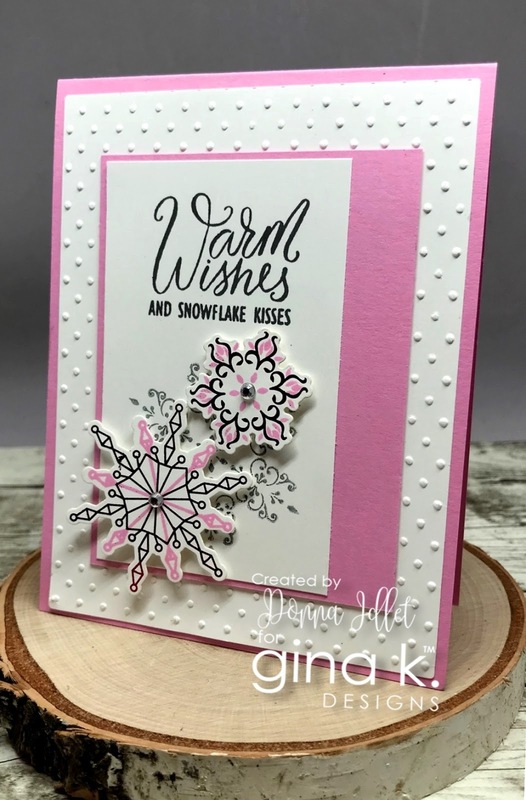 I am in love with the pink snowflakes card. Your Christmas cards are so beautiful! I love them all. Love the non traditional colors especially the pink snowflakes. As a friend of mine says Pink is the most beautiful color in the world. Your cards really stand out, I love them. 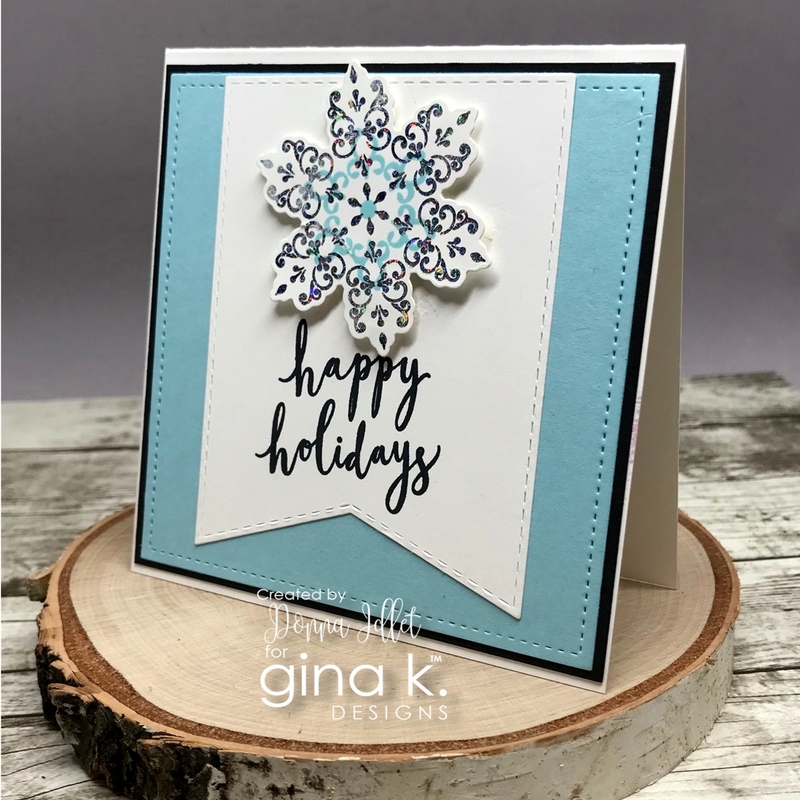 Really like how you used color with the snowflakes! Great cards! All you card are stunning! I love pastel Christmas cards! Love that pink one especially!!!! Beautiful - one and all! I love your cards Donna. I love pink and gray and blue and gray at the holidays!!! Beautiful cards!! 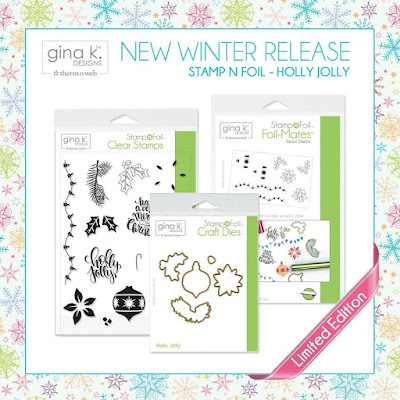 I especially like the first one with the gold embossing and the pink snowflake card. Thank you for sharing your ideas. Beautiful clean card designs! Love the shine and elegance from the foil. Fabulous inspiration. Beautiful. Thanks for the suggestion of non-traditional colors. Lovely! So pretty. I like your Holly Jolly. Some great cards! I think the ornament card is my favorite! Love the pine boughs! Beautiful! I love the card with the ornaments! I love those first two, Donna! You're putting gin the Christmas mood! Wish I'd remembered to use the pine branches with my ornament, looks great! beautiful cards, can't wait to get my order! Gorgeous cards! I love the ornaments!! Beautiful cards. Just lovely. I love snowflakes! the snowflakes are just so elegant! I LUV the pink!! it looks fabulous. Great cards. Beautiful, festive cards. I love those sentiments. Beautiful cards, I love the gold one! I love your cards and this release, just fabulous! Thanks for the inspiration. Your cards are simply gorgeous. I always look forward for your samples. Gorgeous cards! The pink snowflake is so original. What fun these are! I'm usually distracted by my overwhelming love of snowflakes, but I'm really taken your holly jolly cards. The ornaments on the boughs are just so perfect. Thanks for sharing! I enjoy the snowflakes. They look so cool. I like your cards. Beautiful cards and I love all things foil! Such awesome cards! I love the ornaments card design! Such pretty cards. The gold one is my favorite though, gorgeous! Your cards are spectacular! Nice work!! Sensational cards, Donna! Lovely use of the foil! I absolutely love these snowflakes! Your cards are lovely!